The building which became Sacred Heart Convent was built in 1854. It was originally the home of Lawrence Lawrason, London's first Police Magistrate. The first structure, which had the Sacred Heart statue facing it, was the part that overlooked Dundas Street. In 1867, an additional and major structure was added. The Religious of the Sacred Heart operated a school at this location, but withdrew in September, 1913. The Sisters of St. Joseph began to use the building for commercial classes in two rooms as well as elementary classes in two other rooms. The commercial class provided training in typing, stenography, commercial law and other subjects related to business. 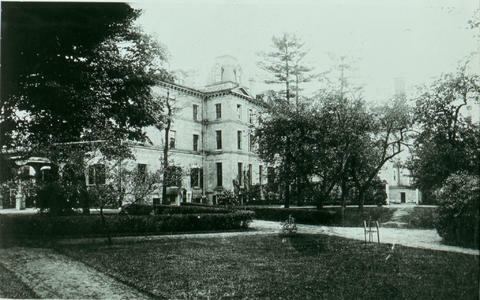 On March 31, 1914 through the efforts of Sir Philip Pocock and Mr. T. J. Murphy, the Sacred Heart Convent and property ownership was secured by the Sisters of St. Joseph. The owners, the Religious of the Sacred Heart, discounted the price for the Sisters who were aided by donations from Philip Pocock and Ed Shea. The building became the new Mother House and Novitiate for the Sisters of St. Joseph. The address was 401 Queens Avenue. The convent housed a Casavant organ, made in Quebec by a company known world-wide for their craftsmanship, and installed in 1931. The Sisters who lived at the convent started teaching music, establishing the Sacred Heart School of Music, later the St. Joseph School of Music, and even an orchestra called the Sacred Heart Concert Orchestra. Mr. César Borré, a renowned Belgian musician, was a friend to the Sisters and helped with music. The first six students from Sacred Heart Commercial High School attended their graduation ceremonies at St. Peter’s Hall Auditorium in October, 1938. When a Departmental inspection took place at the school, it was determined that instruction was above average, and that graduates with a general business or diploma had an education equivalent to a secondary school diploma. In 1915, the Separate School Board bought some of the Sacred Heart School property at the northwest corner. Three years later, the School Board rented room in the convent for a household science class. In 1936, the City Council asked that eight feet in from the property line be given to them, and an iron fence was erected along the new line. In 1946, property on the corner of Queens Avenue and Colborne Street was sold to the School Board. In 1946, the Sacred Heart Convent site was chosen to build a new Catholic high school which would include both a junior and senior school. Until rooms were built for the senior high school, the first two floors of the west wing of the convent were rented to the Catholic School Board and became Catholic Central High School. The boys, with the Christian Brothers as teachers, were on the first floor, and the girls with Sisters as teachers were on the second floor. The Sisters continued to teach girls at Sacred Heart School in grades 9 and 10, while boys in grades 9 and 10 remained at St. Peter’s Parish Hall at what was called De La Salle High School. In 1950, a boarding school for girls was started at Sacred Heart Convent with six students. In the same year, rooms in the convent were rented for high school classes. The Senior School, named Catholic Central High School (grades 11-13) opened in September 1950 in the former Sacred Heart Convent, being the amalgamation of Sacred Heart Commercial School (1914-1950), St. Angela’s College (run by the Ursuline Sisters from 1913-1950) and De La Salle High School (1920-1951). The Senior School was administered separately from the Junior School. This latter school which opened in September, 1952, was named Catholic Central Separate School (grades 7-10). Classes started being taught at Catholic Central High School on September 2, 1950 in its new building, with Father Joseph Finn and Sister Mary Angela Flaherty as associate principals. Eventually, the Christian Brothers left in 1952. The next year, a special class for special needs students was set up, which moved the following year to three rooms in Sacred Heart School. In 1953, the building ceased to be a convent and the boarding school moved to the newly built Mount St. Joseph, and in 1958 to the newly completed wing. It was now called Mount St. Joseph Academy. In 1955, the property was transferred to the Catholic School Board for offices and classrooms. By 1959, most of Sacred Heart Convent had been demolished except the chapel wing, which was torn down in 1986. The new Catholic Central building opened in September 1959 with Sister Elaine Dunn as Principal and with 247 students. In 1960, the formal opening of Catholic Central High School took place. In 1967, the separate school (grades 9-10) and high school (grades 11-13) operated under one principal as Catholic Central High School. In 1986, the North Wing was built, and further renovations took place up until 2000. A blessing and rededication of the school was held in October, 2000. Catholic Central High School held a 50th anniversary reunion in 2001. Series contains Sister Norita Keenan’s single page memoir, a postulant requirement list, souvenir booklet of the Diamond Jubilee, chaplain list, meal seating plan, farewell ceremony agenda and schedule, photographs, land and property maintenance receipts, property sketch, chronology of property transfers and sales, rededication ceremony program and speech, letter from General Superior to Sisters, decorative Christmas card and envelope with list of donors of a car, newspaper clippings, student created books, and Bach sheet music owned by Cesar Borre. Records were transferred from Sacred Heart Convent to the Congregation of the Sisters of St. Joseph in Canada – London site archives. This series is considered closed.